Last week we called drum corps fans to "spread the word" about drum corps to the uninitiated -- the news story HERE invited longtime fans to become marching music evangelists. Alan Mueller of Boone, N.C., wrote in with his drum corps evangelism story: "This is a great idea. Every year I commit to taking a "newbie" to a show. I have introduced at least one new person to drum corps since 1995. This year, for the first time, instead of adults, I took children, my two nieces (didn't get a picture of them), and my lovely 11 month-old daughter. 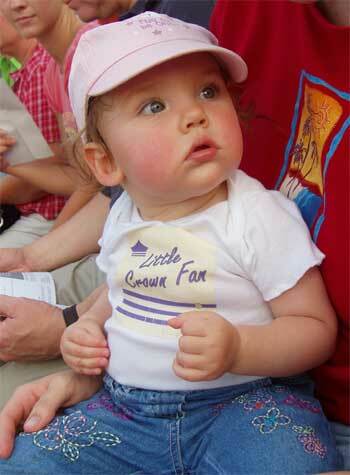 Here she is wearing a custom-made shirt that bears a replica of Carolina Crown's new uniform that says "Little Crown Fan." Thanks Alan! We're asking each of you to reach out and spread the word about the drum corps activity. Knock on doors, e-mail, instant message, even yell if you have to -- but this is the summer for you to bring a friend to a DCI show. Bring a digital camera to the show and take a picture with your new drum corps convert at the show, and send it to dave@dci.org -- we'll post pics as they come in under the headline, "New convert." Great seats are still available at most DCI shows. Pick up the phone, make your pitch, and we'll see you on the 50.